I just received the set of 6 Ball heritage mason jars that I recently ordered on Amazon! What a deal… when I ordered they were on sale for $7.99. The same jars are around $15 at Michaels right now! I am using this particular jar to hold baking soda in my laundry room. I was wishing that there was a way to make this lid into a pour spout… and then an idea popped into my head! 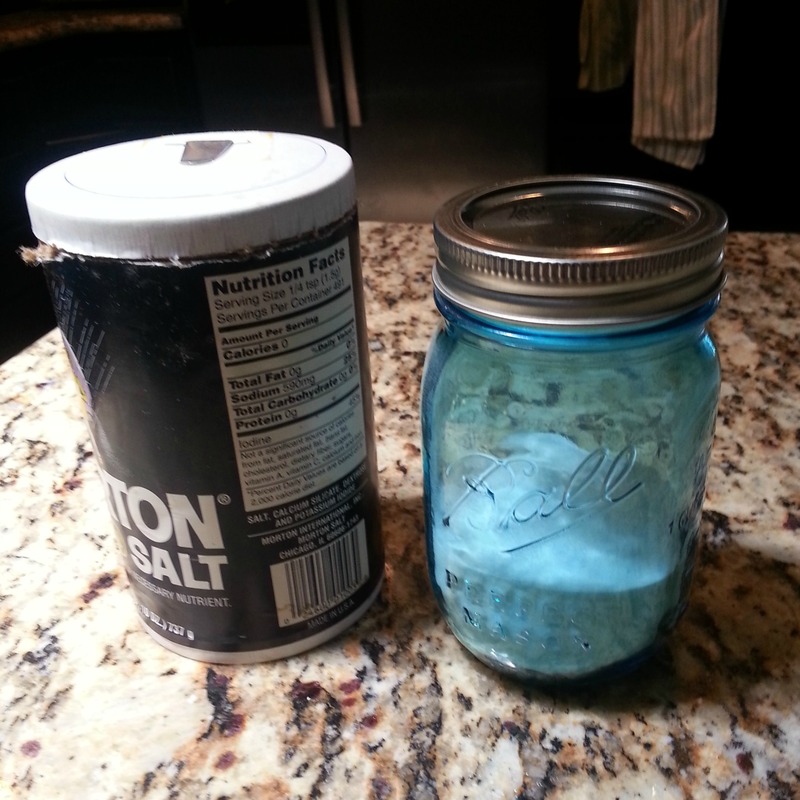 I envisioned the top of a salt container and wondered if I could make it fit on top of the mason jar. 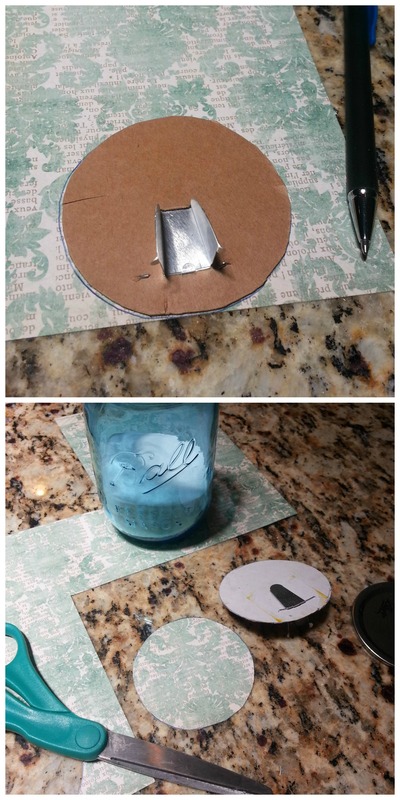 And voila, this is the tutorial that I came up with for making your very own mason jar pour spout lids! Enjoy. 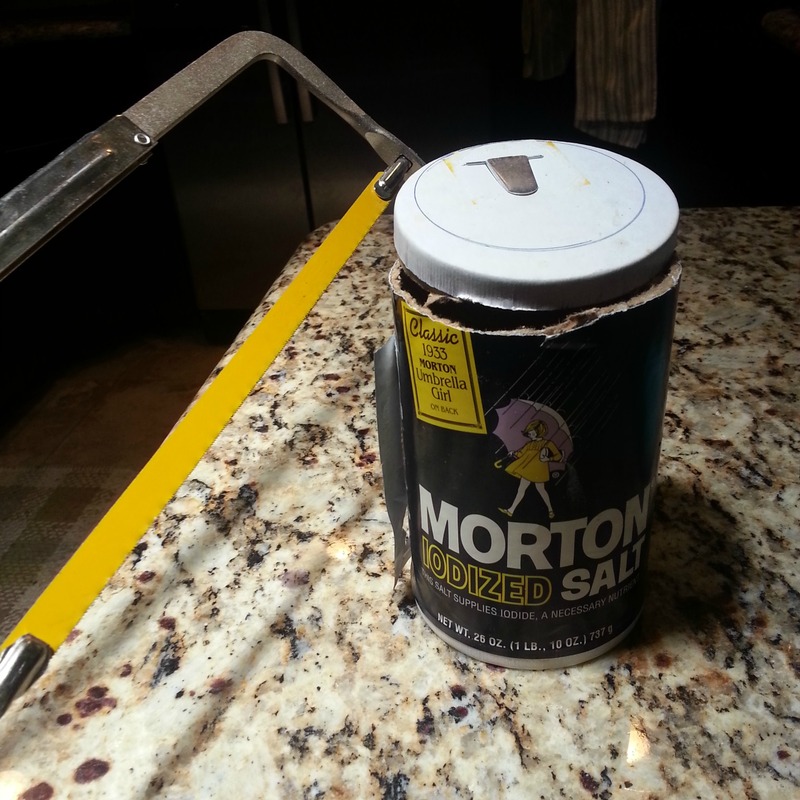 STEP 1 is to saw off the top of the salt container. Please take any necessary safety precautions. 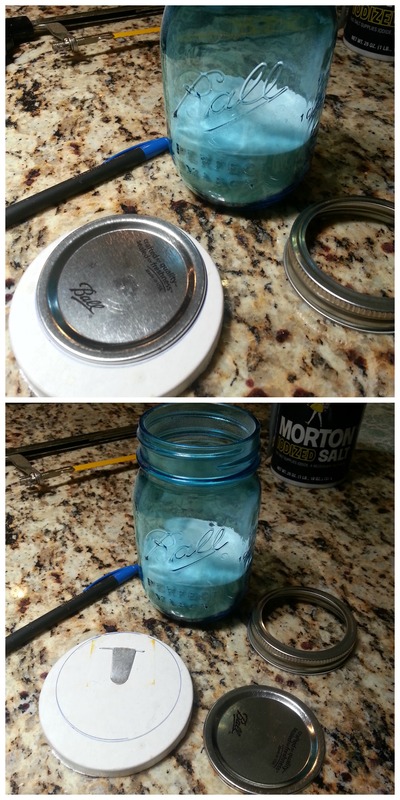 STEP 2 is to lay your mason jar lid on the salt container top and trace it. STEP 3: Cut out your traced circle (not pictured). 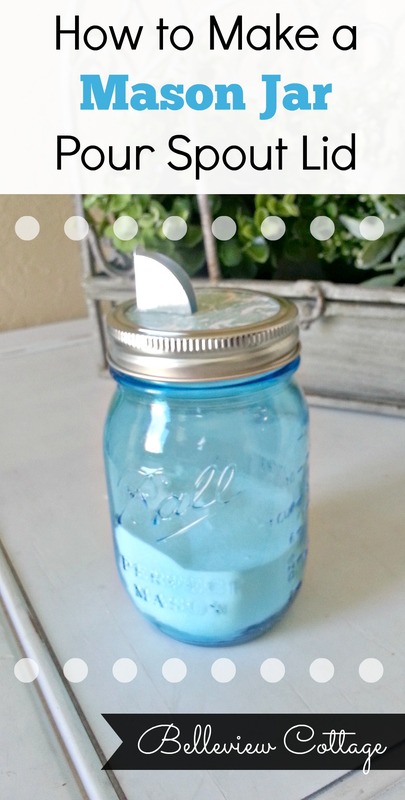 Then place your cut-out into the mason jar screw band to make sure it fits properly. If not, trim your cut-out accordingly. STEP 4: Place your cut-out face-down on the scrapbook paper. 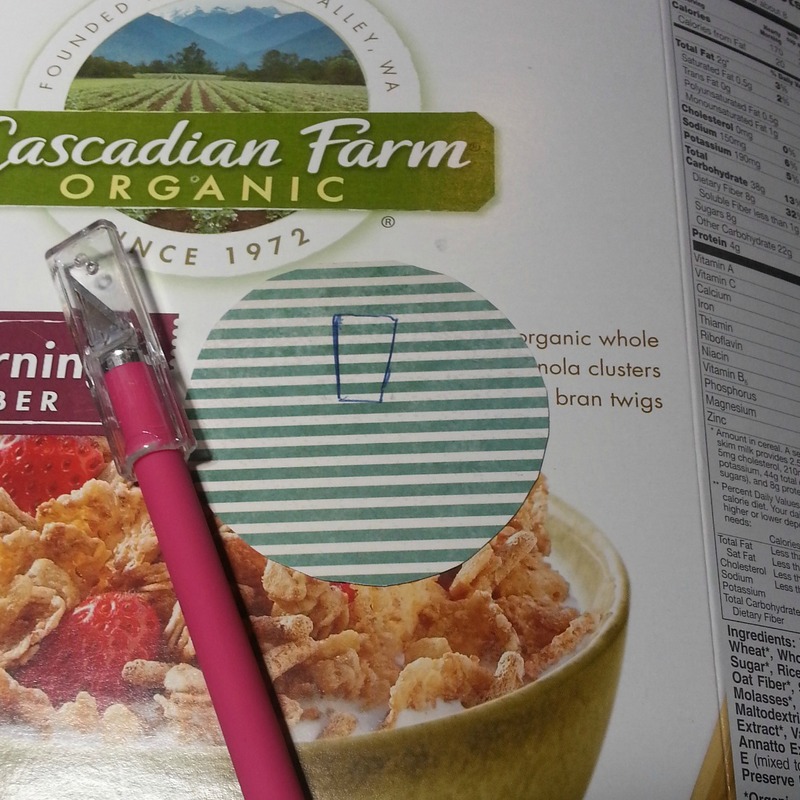 Trace a circle onto the scrapbook paper. It is ok to trace right onto the top of the paper, because the edges will be covered by the screw band. Then cut out the scrapbook paper circle. STEP 5: Now turn your scrapbook paper circle over. (The back side of my scrapbook paper has this stripe pattern on it.) Turn your spout cut-out right-side-up, and open the spout. Trace the inside opening of the spout onto the back of your scrapbook paper (see picture below). You may need to bend the spout open slightly, to fit your pen or pencil in the spout. You can easily bend it back when you are done with this step. 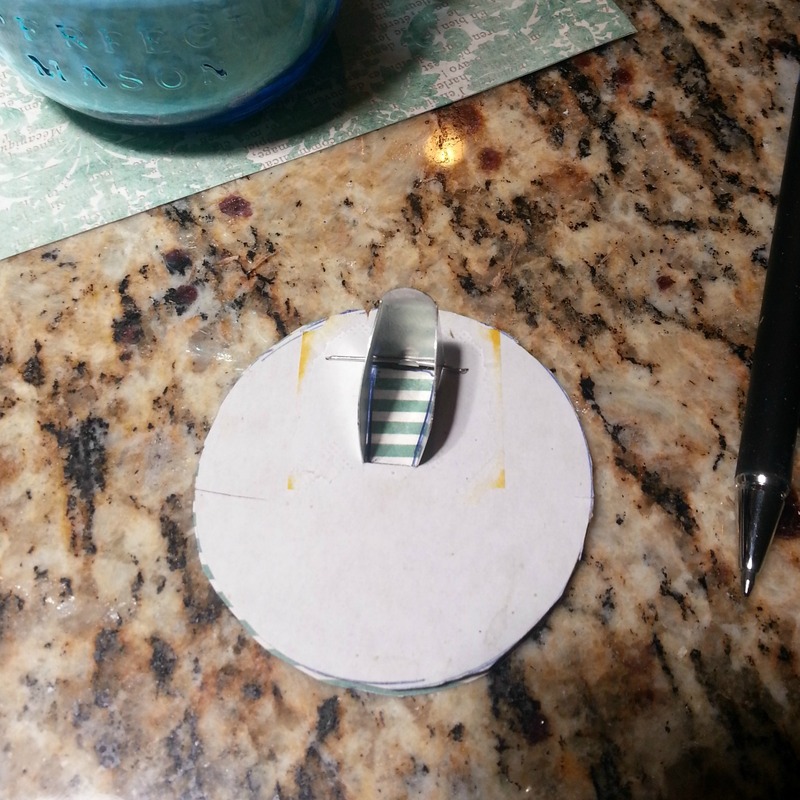 STEP 6: Use a craft knife to cut out the hole for your spout. 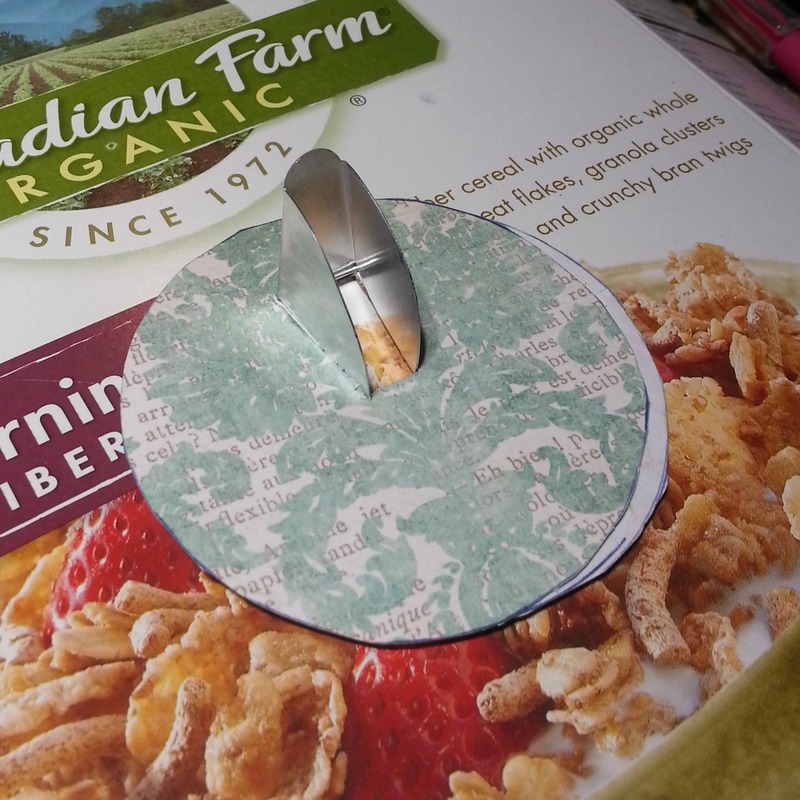 Use an appropriate surface for cutting (mine was an empty cereal box). 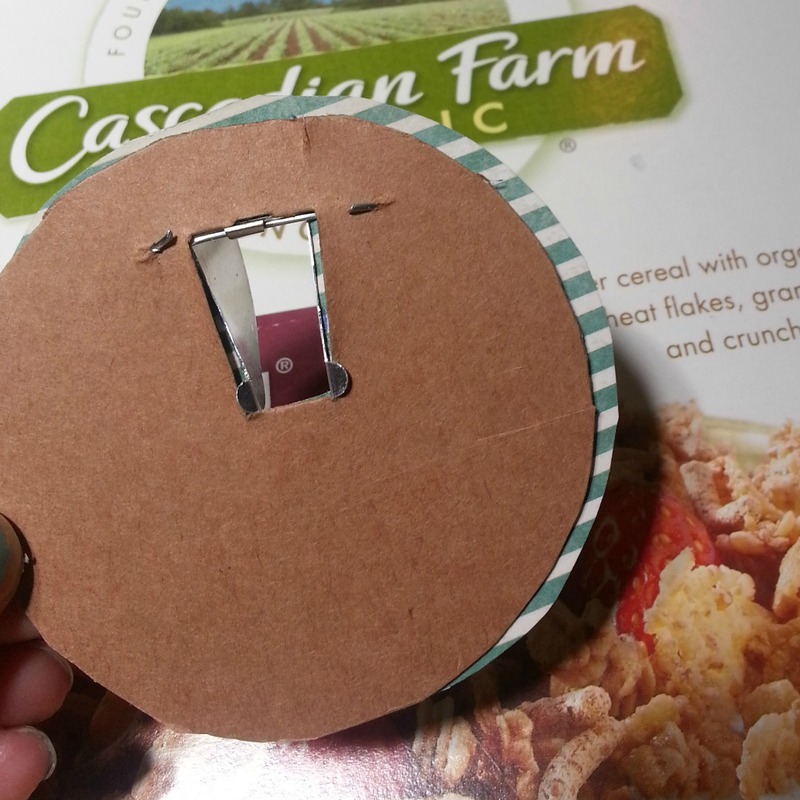 STEP 7: After cutting out your spout-hole, place the scrapbook paper over the top of the spout, to make sure it fits. Mine, unfortunately, turned out way off-center. I’m not sure how this happened. I must have been in a hurry. No worries, though! The edges are going to be covered by the screw band anyway. If yours turns out off-center like mine did, turn the whole thing over and use scissors to trim the edges of the scrapbook paper. 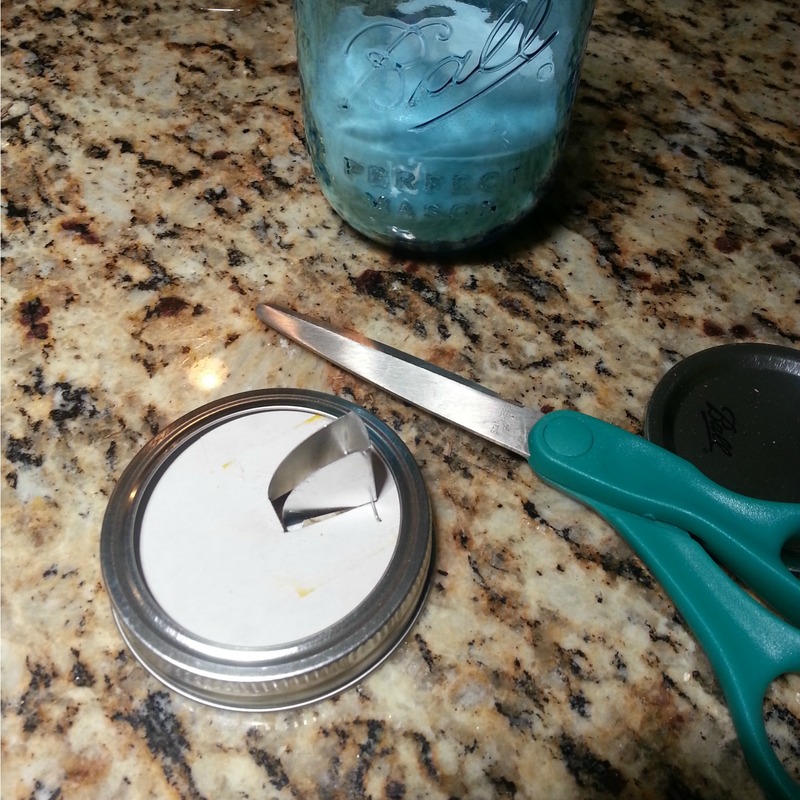 FINAL STEP: Place your beautiful pour-spout lid inside the screw band, and screw it onto your mason jar. You don’t need to glue the scrapbook paper onto the lid, because the screw band will hold it in place. 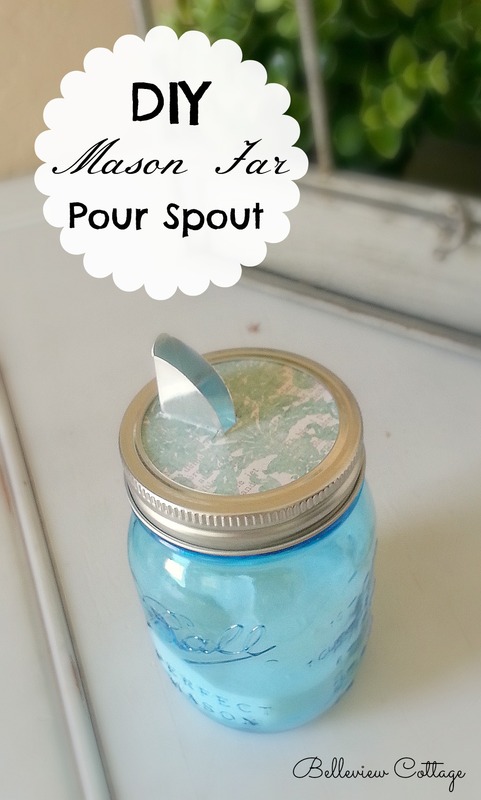 I hope your DIY pour spout lid turns out beautiful! I am looking forward to using my new pour spout to add baking soda to my laundry when needed. If you like this tutorial, be sure to subscribe for e-mail updates when I post new tutorials to the blog! Happy crafting. Previous Post Easy No-Sew Fabric Bunting Tutorial! "Little Man" First Birthday Party!